346 p., 4 ill., 14,7 x 20,8 cm. With contributions by Werner Balzer, Christoph Biermann, Ronald Britton, Jürgen Hardt, Matthias Hirsch, Walfried Linden, Raúl Páramo-Ortega, Ellen Reinke and Rolf Tiedemann. The author refers to two classes of fantasies: unconscious fantasies that have been unconscious all along and wish-fulfilling narratives that are subsequently repressed. His critique of Freud’s 1908 paper »Creative Writers and Day-Dreaming« is that Freud, because he focuses primarily on wish-fulfilling narratives, fails to distinguish between »the truthseeking function of some fiction and the truth-evading function of other fiction.« Turning to Melanie Klein’s theories, the autor makes the interesting point that as Klein enlarged the concept of fantasy, she assumed that this would not be contentious because in her mind she was doing no more than building on the work of Freud. She viewed herself as incorporating ideas of two of Freud’s earliest collaborators, Ferenczi and Abraham, both of whom had been her analysts and teachers. For Ferenczi, »the infant perceived the world in identification with parts of his own body, endowing it with symbolic significance,« while Abraham assigned cannibalistic fantasies to the oral stage of development. Both points of view imply that fantasy is intrinsic to earliest life. Rather than deriving fantasies from internalized play as did Freud, Klein saw play itself as an offshoot of unconscious fantasy. The author offers an comprehensive overview of Klein’s thinking and the modifications developed by Bion and Segal. He uses his deep understanding of the work of all these theorists, and of Winnicott as well, to discuss from his own point of view, especially under the aspect of a triangular space, both imagination and literatur, particularly the difference between escapism (related to wish-fulvilling narratives) and serious creative writing (related to unconscious psychic truth). This paper uses Freud’s idea of a »psychic surface« heuristically in order to study how psychoanalysts conceive of the formation of the immediate analytic situation, thus designing their daily surface of work. Implicit notions of »psychic surface« are - more or less consciously - constantly operative as conceptual organizers in the preparation of clinical »facts«. Starting from Freud’s intrapsychic conception of »surface« and the pathogenic material as an »infiltration« in the patient the metamorphosis of the latent notions of surface up to the »unconscious interaction« are described alongside the literature, with a shift of the »surface« between the analytic partners or even into the analyst himself. Those changes of the immanent conceptions of »surface« concern, in particular, the transformation problem between past and present, the definition of relevant material, its proximity to the prevailing affect and the imaginary location of the surface itself. From the impact of object relation theories, a move from »reveiver« to »container« and a dialogical view of anxiety result certain common traits of contemporary expectations of surfaces: a special attention to the central axis of externalization/internalization, the »enactment« of psychic processes instead of representational figures (Gestalten), i. e. for modes of object relations rather than object representations, to functions instead of entities, formal aspects instead of semantics, metonymias instead of metaphors, contextuality instead of causality. Possible gains and losses ensuing from this conceptual change are discussed. Eventually the issue is, whether this change follows as a logic result from the history of analytic technique itself or if it represents already a quiet reply to contemporary structural losses within internal worlds with a weakening of symbolic representations - marking a departure from the function of interpretation to the interpretation of functions. The meaning of the last scientific text of Freud which has been ignored by Freud scholars is investigated. Using already published material the author attempts to reconstruct the meaning of this text within Freud’s complete works. In this text the author sees a programme-like concise formulation of Freud’s scientific concerns. In this the task of psychoanalysis is to develop a psychology of the unconscious, which unfolds and moves on the one hand following an everyday understanding of psychic processes and on the other hand in complete contrast to it. This approach of Freud seems to be a provocation for the practice, teaching and presentation of psychoanalysis, which the editors of Freud’s legacy and consequently the main stream of psychoanalysis wanted to moderate by turning Freud’s final works into a kind of dogma. The healing and the mental health concepts are inseparable from social esteemed values. Since the beginning, Freud’s concept of healing contained elements inherent to social critic. »Wanting to cure«, in Freud’s view, was something suspicious (also believed by Nietzsche and Goethe). The therapeutic value of the psychoanalytic method is linked to the beneficial effect of understanding and knowledge. The analyst, as well as the analysand, are unconsciously immersed in social and historical conditions. The analyst continually faces the unreachable task which is proper of his »impossible profession«, that is, to try to put himself at a certain distance from »the spirit of his time (Zeitgeist)«. The introjection of external experiences leaves behind alien bodies in the ego, if they cannot be assimilated (by identification) or renounced. Introjects of this kind come about owing to the implantation of excessive violence (sexual abuse and beatings in childhood, later tortur and terror in concentration camps) or following unmourned serious losses. The introjects result in severe anxiety, depression, depersonalization and somatic symptoms, which are difficult to remove. They may be passed on to following generations where they have an introjective effect without the trauma being directly experienced. Introjects are always linked with massive feelings of guilt. Freud’s concept ›heritage of emotion‹ is considered as salient also in reference to Germany’s Second Generation after the Nazi rule and crimes. In this respect, Nazi heritage is considered not as tragic, but as conflictuous with deep unconscious and borrowed guilt feelings. Unconscious guilt feelings may become analyzable if the analyst includes into his understanding of the patient the latter’s possibilities to reenact his conflicts and traumata on the stage of a ›cultural space‹ (Parin). This ›cultural space‹ is considered to be situated on the sphere between the individual and his environment. Puberty may provide such a cultural space through creativity natural to this life phase (Eissler: ›second chance‹). Guilt feelings, shame, helplessness and distress may be allowed to surface to the individual’s experience and consciousness, while they remain repressed in the family and the societal sphere. Clincial experience in respect to young women and their special inhibition of life giving and impairment of being a mother (Rosenkotter) is related to life destruction policy, so typical to the Nazi policy. Examples of such a ›cultural space‹ in post war Germany are discussed. 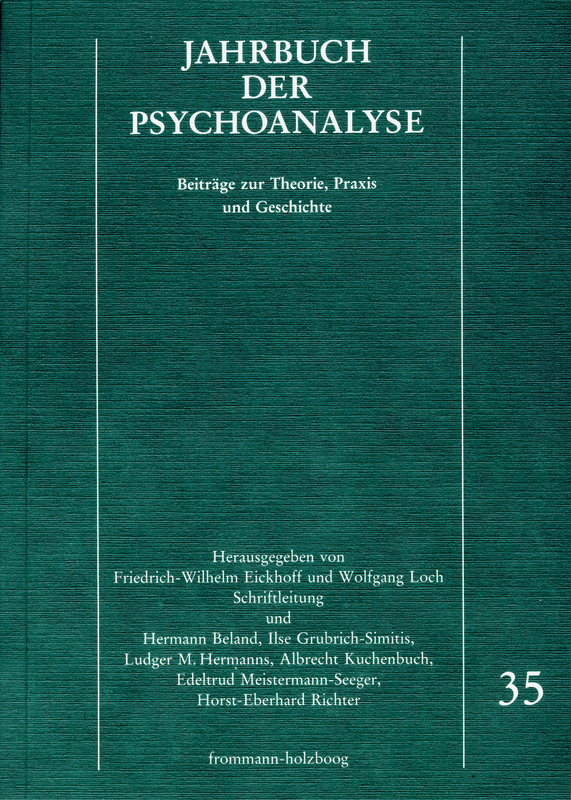 The author draws attention to a place in the text of »Dichtung und Wahrheit« from which it emerges that Goethe recognized Lili Schönemann’s symptomatic act as such and explained it in a psychoanalytical manner. The description and meaning of this symptomatic act is embedded in an ostensibly »occasional poem« (described by Goethe himself as a »joke«) which Goethe ostensibly wrote in the night of the 17th birthday of his then fiancee Lili, as an apology for his appearing too late for the birthday party. Evidently Goethe, however, was in Switzerland at the indicated point intime. The author surmises that in the »occasional poem« it is a matter of a dream of Goethe, which could have as its subject Goethe’s feelings of guilt towards Lili. With the type of portrayal of this presumed dream as »occasional poem«, Goethe, in the author’s view, permits himself a joke with the reader of »Dichtung und Wahrheit«. Given this »joke« the author tries to show some principles of construction according to which Goethe presumably drafted »Dichtung und Wahrheit«. The split of ego-identity in Goethe, which finds expression in Goethe’s love life and in character couples in his poetry, is described and interpreted as a sign of an early disturbance and consequence of narcissistic defense. The genesis of the condition is presented using Goethe’s childhood, special significance beeing attributed to the absolute norms and the conflicts of values connected with them in Goethe’s upbringing. »How does Freud’s legacy get on with our more and more German consciousness« (Beland, 1989, 7)? It seems to me there is an irreconcilable contrast here insofar as Germany, the German language and culture, are historically the place and time for the enlightenment, home, Nazism and Auschwitz. This unsolvable conflict is for Germans a challenge for the transgenerational restoration of human orientation towards a »depressive position« on the levels of individuals, families and society. The term »depressive position« has its roots historically in Kleinian psychoanalysis insofar as this term describes the capability to form mental structures, to sublimate splits in favour of ambivalence, such as in terms of instinct fusion (Laplanche St Pontalis, 1967; 1972, 57). Against this background it is necessary - with a few exceptions - to continue to ask about typical »German psychoanalytic processes« in which unconsciously free association, evenly suspended attention and interpretations neglect the analysis of the indissoluble contradiction here, i.e. persist in a state of being split. How is it possible to live with this conflict? What does »restoration of human orientation towards a depressive position« actually mean in this context in terms of psychoanalysis and history? – What is alien today about the Nazi-time can theoretically be described as a basic assumption (Bion 1961) of »relational arbitrariness« at the service of maximum unfolding of power by means of collective crime on the part of the society of adult people. In it the transgenerational basic conflict of »child saving and child killing« (Kestenberg & Kestenberg 1987) was functionalized in favour of the latter. Bearer of the basic assumption was the majority of adult Germans 1933-1945 as perpetrators and fellow-travellers. – We Germans now are for the most part the descendents of these perpetrators and fellow-travellers and have to expect an initially unconscious transgenerational after-effect of National Socialism as a legacy and burden in terms of a transposition. Denial, projective identification and acting out of this after-effect may - again transgenerationally - be restructured into memory and a new beginning by becoming awareness and reparation. – The ability to mourn in view of National Socialism as a memory and a new beginning presumes a transgenerational revival of the life drive (Freud) towards sublimation as a condito humana in contrast to the dominance of the death drive as a conditio inhumana (Freud) in Nazism. Characteristic goals for this sublimation are the limiting of unavoidable psychology of the masses - also dure to subjectivity - to a »benign« level (Kernberg 1993) and the accepting of the basic conflict of »child saving and child killing« in the world of adults. An acceptance of this basic conflict implies in the face of inevitable psychological ambivalence renunciation of neutrality of the impartial onlooker or of a well-meant naivity of the fellow-travellers for both - this is shown by historic memory and reflection - would help the defusion of drives, i.e. splitting processes to become predominant. The basic conflict needs for its structure-giving assertion a historical primacy of the life drives in the order of generation. Seen thus the traditional ethics of conflict psychology in psychoanalysis (i.e. the search for truth) presumes ethics of psychology of relationship (i.e. the search for love). If before the time of Nazism the search for truth was often emphasized in psychoanalysis, the search for love must receive particular attention after the time of Nazism. Neither of these two questions - which often but not always appear in contrasts - can remain understandable and historically effective without the other.